Today was Day #3 of Chocolate and the Great Outdoors Theme Week. Let's begin with a visit I made to an indoor outdoor world that I didn't know existed. 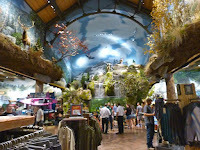 Recently I visited a Bass Pro Outdoor World Store in Rocklin, CA. If Walt Disney had teamed up with a natural history museum display builder to design a store for hunting, fishing and outdoor living, this might have been the result. Taxidermied animals depicted in re-creations of their natural habitats hung on every well, under a vaulted ceiling painted sky blue with clouds. When I wandered over to hunt for some chocolate in the food section, I saw books on how to filet and cook wild game, I knew I was outside the big city and closer to the Great Outdoors, which has always accommodated a wide variety of pastimes. Me, I'm a tree hugger, a bunny lover, a hiker, and a hypocrite. I buy packaged chicken and fish to eat, but I'd find it hard to kill anything. 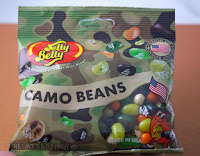 So, please forgive me if I just eat some Uncle Buck's* Sweet and Nutty trail mix as part of a Bay Trail walk, along with a few Uncle Bucks' Double Dipped Chocolate Peanut(s), and chocolate pudding flavored Jelly Belly beans (in camouflage packaging). The only ducks I plan to shoot today would be with my camera. 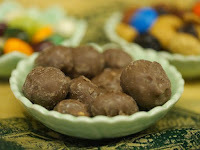 The Uncle Buck's Sweet and Nutty trail mix contained MandM's chocolate candies, raisins, peanuts, almonds and cashews. And the Uncle Buck's Double Dipped Chocolate Peanut(s) were, as advertised: peanuts generously coated in chocolate. The chocolate melted a little in the heat, but these peanuts were still tasty on today's hike. *Uncle Buck's is a Bass Pro brand. 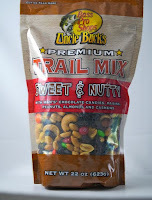 Uncle Buck's Sweet and Nutty trail mix was manufactured for Bass Pro Shops by Kar's Nuts (Madison Heights, MI). Since I've already had a similar Kar's trail mix, I'm also including Uncle Buck's Double Dipped Chocolate Peanuts, distributed by Ruckers Wholesale (Bridgeport, IL).